PNNL scientists and colleagues examined microbial community mats from Hot Lake in northcentral Washington State to study community responses to environmental changes. Understanding and ultimately predicting microbial community assembly could further the goal of engineering the communities to carry out desired bioprocesses. Results: When scientists at Pacific Northwest National Laboratory took samples of a microbial mat community from a hypersaline lake to study community responses to environmental changes, they expected to find that the changing salinity drives large changes in the types of microbes populating the mat. "Instead," said Dr. Steve Lindemann, PNNL microbiologist and the study lead, "we found that the microorganisms composing the mat remained relatively stable throughout the year, even though the lake's salinity varied more than tenfold during that period. Furthermore, using ecological analysis coupled with the environmental metadata, we concluded that seasonal variation in the availability of energy from light, rather than salinity, exerted the most influence on the mat community's composition." This study, which was conducted with collaborators at the Department of Energy Joint Genome Institute and Washington State University, used samples from Hot Lake, located in northcentral Washington State. The work appeared in Frontiers in Microbiology and was featured on the journal's website. Why It Matters: These results shed light on the ecological drivers of the mat's seasonal assembly and disassembly cycles in the face of environmental change. The unexpected importance of light availability further suggests that interspecies interactions within microbial communities, especially those between cyanobacteria and heterotrophs, may lend community resistance to environmental stress such that the community's tolerance is greater than the sum of its parts. This brings scientists closer to a predictive understanding of microbial community assembly, which, in turn, could further the ability to engineer stable, resilient communities capable of carrying out desired transformations and bioprocesses even when exposed to destabilizing environmental conditions or invasive organisms. Phototrophic microbial mats are compact ecosystems composed of highly interactive organisms in which energy and element cycling take place over millimeter-to-centimeter-scale distances. Methods: The researchers examined space and time variation in the mat community at five time points throughout the annual cycle with respect to prevailing physicochemical parameters by using short-read 16S rRNA sequencing in tandem with near-full-length 16S rRNA sequences. What's Next? The scientists are now working to deduce the rules by which the Hot Lake mat and mat-derived simplified communities assemble by investigating the natural system in the field and under controlled conditions in the laboratory. Sponsor: U.S. Department of Energy Office of Biological and Environmental Research's Genomic Science Program through the PNNL Foundational Scientific Focus Area. Research Team: Steve Lindemann, Jim Fredrickson, Jim Moran, James Stegen, Ryan Renslow, Janine Hutchison, Jessica Cole, and Alice Dohnalkova, PNNL; Julien Tremblay, Kanwar Singh, Stephanie Malfatti, Feng Chen, and Susannah Tringe, Joint Genome Institute; and Haluk Beyenal, Washington State University. Reference: Lindemann SR, JJ Moran, JC Stegen, RS Renslow, JR Hutchison, JK Cole, AC Dohnalkova, J Tremblay, K Singh, SA Malfatti, F Chen, SG Tringe, H Beyenal, and JK Fredrickson. 2013. 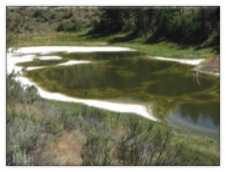 "The Epsomitic Phototrophic Microbial Mat of Hot Lake, Washington: Community Structural Responses to Seasonal Cycling." Frontiers in Microbiology, Special Topic on Systems Biology and Ecology of Microbial Mat Communities 4:323. DOI: 10.3389/fmicb.2013.00323.